My mom was planning on getting me a Severe for good grades in school, and I've always wanted a Macaw. The only problem is we don't know how loud they are, and we... (more) Ava. 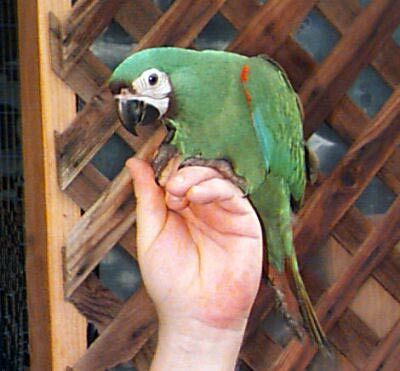 The Severe macaw is one of the "mini" macaws. The baby Severe Macaw pictured above, "Fuzz Button" is one of two very sweet, friendly baby birds! The Severe Macaw makes a wonderful pet for if you want the macaw personality, but in a smaller size. The Severe Macaw is a very clownish and lively little mini macaw. They are small and easy to handle, and a hand raised Severe Macaw is very social and affectionate. Though there aren't as many of these birds as some of the other macaws, they are ready breeders and are becoming a bit more available. Severe Macaws are eager to play and enjoy interacting with their keepers. Adept at learning some tricks, they can also be pretty fair talkers. These mini macaws are very loyal, and do tend to become a one person bird unless well socialized as babies with continued handling on a daily basis. Distribution: The Severe's natural habitat runs from eastern Panama in Central America south as far as Bolivia and Brazil. This is a wide range, and they have not been impacted by collection like other types of macaws. A number of these macaws were brought into the in the 1980's, but with little adverse affect on their populations. It is the deforestation of their natural habitat that poses the most serious threat to these mini macaws. Description: Severe Macaws are a mini macaw, like the Hahn's Macaw or the Yellow-collared Macaw. They are predominantly green with patches of red and blue on the underside of the wings. Their chest feathers are tipped with a bit of chestnut brown, which is where their alternate common name is derived from. They have bare facial patches with fine black lines running across it. There is also a bit of brown down the sides of their cheeks and under the chin. A band of brown also goes across their forehead. Social Behaviors: The Severe Macaw is a social and friendly mini macaw, and a great choice if you want a smaller macaw.. These mini macaws are intelligent and eager for attention and play. They have a good disposition and respond well to handling and training. But they are a typical macaw and can be cranky at times and may prefer only one person or only one gender. Breeding/Reproduction: The usual clutch consists of two or three eggs which incubate for about 26 days. The babies will fledge after about 3 months in the nest. Feed the parents plenty of greenstuffs, corn-on-the-cob, carrots, and fruit laced with food supplement while they are rearing the youngsters. The juvenile Severe Macaw seen here is one of two very sweet hand fed babies. The father (Phillip seen in the picture above) and mother are about 14 years old. They had three eggs, two of which hatched. The third egg was cracked and never hatched. We pulled the babies from the nest when they were four weeks old, and hand fed them from there. The babies are about 12 weeks old and are still taking one feeding per day. They both are very affectionate and love to cuddle into your lap or chest wherever you hold them. They can be noisy but with a little attention they will calm down and be very good companions. Usually they make noise in the morning because they are so excited to have the cover removed from their cage, and they like to be fed. Availability: There are not as many Severe Macaws in captivity as there are other types of mini macaws. But they are a delight to own, and have proven to be ready breeders. More are being bred today, and occasionally you can find these macaws for sale. My mom was planning on getting me a Severe for good grades in school, and I've always wanted a Macaw. The only problem is we don't know how loud they are, and we already have two amazons. Is anyone able to compare the noise level between a Severe Macaw and a Mexican Red headed Amazon? Our severe macaw, a 15 year old rescue is adorable, but so loud that our neighbors across the street can hear him even when our windows are closed. They yell mainly in the morning and in the evening, at sunset. It is sometimes overwhelming to put up with his yelling. hi i also have a Severe , they are very loud . And they want alot of attention. And they are one person bird. My advice to you is to get a quaker parot . Even tho its smaller the best talker of them and the cheapest. I also have a hanns mcaw . Go with the quaker best for interaction. Severes are not for everyboduy- it took me four days with gloves on to even get mine to tolerate me! he was given to me, she is an older bird, and it is amazing, the words she knows, and the fact that we can converse. They really do know what they are saying... Now we are besties, and I would really like to find a friend for her. Not a good idea to get your bird a friend, because she could bond with the other bird and not want much to do with you.